You can regrade a question for an assessment in Gauge. Regrading allows you to change the correct answer or point value for a question. The point value can also be changed for individual answers for questions with varied point values. 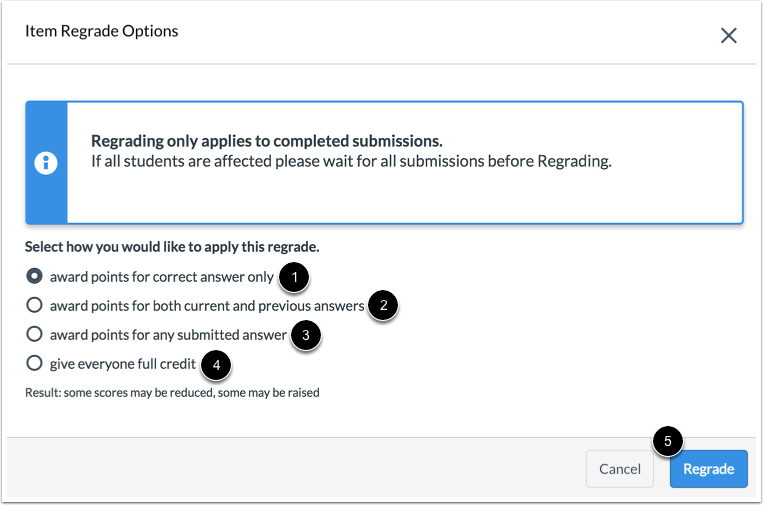 Regrading only applies to completed submissions. If all students will be affected by the regrade, please wait for all submissions before regrading. Regrading is not available for Essay or File Upload questions. Only point values can be changed for Categorization questions; correct answers cannot be changed for this question type. Click the Moderate icon for the assessment you want to view. Note: The Moderate icon may not be available for teachers viewing institution-created assessments. Click the link for a student attempt. Find the question you want to regrade . Then click the Regrade button . To change the correct answer for a question, select the correct answer for the question. Note: This step shows how to regrade a Multiple Choice question. The steps to change a correct answer will vary based on the question type. To customize the point value for the question, type the point value in the Points field . If the question varies points by answer, the point total can be changed in the Points field for each question . To save your choice and regrade the question, click the Regrade button . Note: Awarding full points for correct answers only may reduce some students' scores. Previous Topic:How do I review and grade student answers in Gauge? Next Topic:How do I view my deployments in Gauge? Table of Contents > Admins & Teachers > How do I regrade an assessment question in Gauge?